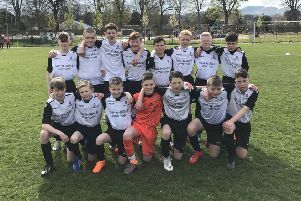 PENICUIK HIGH SCHOOL became the first Midlothian team to reach the final of the Scottish Shield after a 3-2 win over Strathaven Academy at Airdrie’s Excelsior Stadium. The South Lanarkshire side took a first-half lead through Jack Getty but Penicuik got themselves level after half-time as Joe Viola created space down the left before finding Lawrence Naismith in the box and his header found the far corner of the goal. Penicuik took the lead on the hour mark. Naismith turned creator on this occasion as he floated a corner into Stephen Scott, who headed home powerfully. With 16 minutes left, Penicuik looked to seal their place in the final and they did so with time to spare. Kyle Scott intercepted the ball before driving into the area and firing home to extend his side’s advantage. Late on, Strathaven pulled a goal back when Getty prodded in from close range for his second but Penicuik held firm to claim victory.